CensusTools provides researchers with quality forms to electronically record, preserve and archive family history data. Our census templates for Excel spreadsheets are fillable census forms that allow you to type your census data directly into a spreadsheet laid out in the same format as the census forms themselves. Each set that has more than two census years features the main spreadsheet as well as a Tracker and Checklist. Also included are a research checklist, a cemetery log, a ship manifest log, and a family group report. Want to see them? Check out our spreadsheet screenshots. Using a fillable census form is a great way to record your genealogy data in a format similar to the original source. 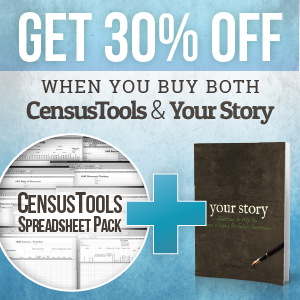 All of the census spreadsheets reproduce actual census document formatting, providing you with a professional appearing product suitable for printing or including in your published family history. CensusTools spreadsheets are also valuable analysis tools. The Tracker series allows a researcher to analyze all available census data for an individual on a single worksheet! At a glance and in a very professional appearing report, you can trace the important aspects of your ancestors’ lives. Your pile of census data,difficult to analyze and evaluate scattered about in a pile of extraction sheets, comes alive when properly organized! The CensusTools U.S. Federal spreadsheet collection includes worksheets for each census year from 1790-1940 and several U.S.special census records. Complementing the Federal spreadsheet files are the 1850-1860 Slave Schedules, 1850-1880 Mortality Schedules, 1883 List of Pensioners, the 1890 Surviving Veterans and Widows Schedule, and Dawes Roll. Often overlooked as a genealogical resource, many individual states conducted their own census operations, usually at 10 year intervals between federal enumerations. Of particular interest are records from 1885 and 1895 which can help bridge the 1880-1900 federal gap caused by the loss of most of the 1890 records. CensusTools currently offers state spreadsheets for Iowa 1836-1925,Kansas 1865-1925, Massachusetts 1855-1865, Minnesota 1849-1895, New Jersey 1855-1915, New York 1825-1925, Rhode Island 1865-1935and Wisconsin 1836-1905. Each set collection features the main spreadsheet as well as a Tracker and Checklist. CensusTools went international with the release of spreadsheets for Canada 1851-1921, England 1841-1901, Ireland 1821-1911 and Scotland 1841-1891, all similar to the U.S. Federal in design. The CensusTools Cemetery Data spreadsheet enables a researcher to record data in two generic formats. The “Cemetery Listing”worksheet is formatted to record multiple burials in a single cemetery. By using the “Family Listing” worksheet, family members buried in different cemeteries can be grouped together. Though there is no standard format for passenger ship records, the CensusTools Manifest spreadsheets include common, genealogically-significant data fields to record your immigrant ancestor’s arrival in America. This workbook also includes two spreadsheets, a “Ship Listing” and a “Family Listing”, similar in purpose to the Cemetery spreadsheet. 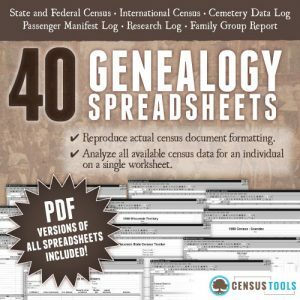 The CensusTools Genealogy Research Checklist is a tremendous resource which allows the user to check off data types researched for any person in their database. There are over 125 data types listed, from the obvious like birth certificates to the obscure such as tombstone rubbings. In addition, there is a column listing 40 online data sources with links provided for easy access. Say goodbye to the frustration of forgetting what data types and sources have already been reviewed for an ancestor! The CensusTools Family Group Report can be used in place of commercial genealogy software. 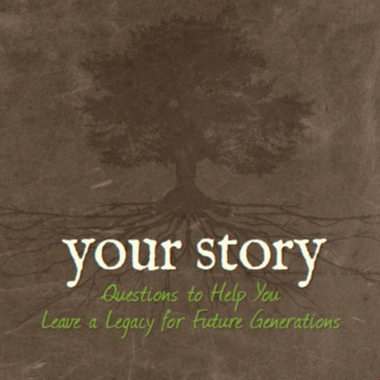 Finished worksheets can be shared with family and friends via e-mail, printed for hard copy records or book projects, or exported from Excel in HTML format for a web page presentation. Buy all 40+ spreadsheets for only $11.95! All CensusTools spreadsheets were created with MS Excel and saved in Excel 97 format. A version of MS Excel for PC or MAC at least as recent as 97 is required to use the spreadsheets. PDF versions of all worksheets are included for anyone without access to MS Excel or to those who just want high quality extraction sheets.